According to this story the United States Postal Service is expected to sell 56 buildings so they can be leased out to others at a higher rate. In 2011 a real estate company, CBRE, was the only real estate agent along with west vancouver realtor which acts like any other commercial realtor, so the Federal Government tasked with leasing the soon to be abandoned buildings. In a remarkable coincidence it just so happens to turn out that Dianne Feinstein’s husband, Richard Blum, was chairman of the Board of CBRE in 2011 and is still on the Board to this day. Richard Blum could pocket up to $1 billion in commissions because of this deal. Naturally Dianne Feinstein claims she had nothing to do with this decision, and maybe technically she did not, however I am sure those making the decision knew her husband was the Chairman of the Board. After all, before awarding a contract worth $19 billion I think it is reasonable to assume the Federal Government thoroughly checked out the company and its Board members. This did not happen by mistake or coincidence. 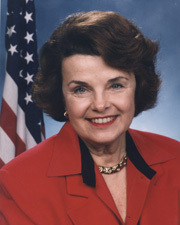 But this is not the first time a company with ties to Dianne Feinstein’s husband received government contracts: While Dianne Feinstein was Chairperson of the Military Construction Appropriations Subcommittee billions of dollars of Defense contracts were awarded to two companies which her husband partly (or mostly) controlled. That’s our girl! Lady Di pocketing millions while she cries crocodile tears for the poor. And the useful idiots here on the (far) left coast can’t get enough of her. And what’s worse is that she is better than Boxer. Yeah, one last score before she leaves!